SAN JOSE, California — On Sunday, February 10, 2013, forty Jews, Christians and Muslims united to build peace by serving 220 meals to the hungry and homeless at Cityteam Men's Recovery Center. Volunteer orientation was led Rabbi Joshua Berkenwald of Congregation Sinai, Pastor Larry Albright of Lincoln Glen Church, and Sister Fatma Elashmawi of South Bay Islamic Association. 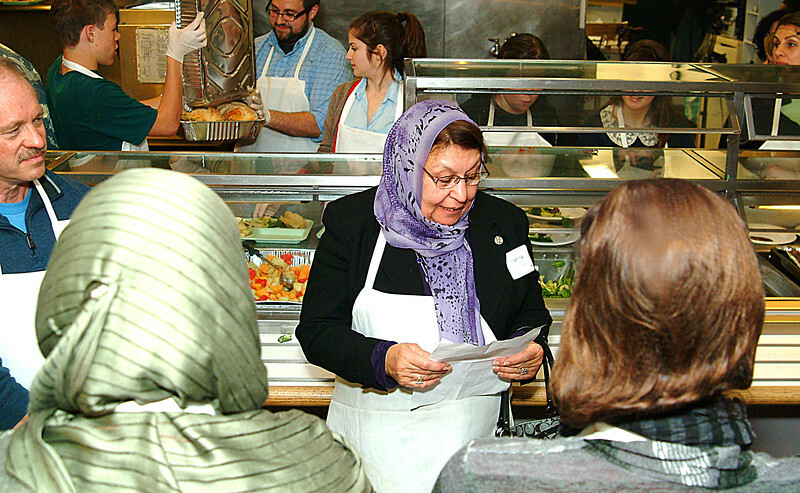 Jewish, Christian and Muslim volunteers united in buddy groups to get better acquainted while collaborating to make both a kosher and halal meal. Before serving dinner, Rabbi Berkenwald, Pastor Albright and Sister Elashmawi thanked God for the food and recited traditional blessings in Hebrew, English and Arabic. After meal service volunteers dined together in buddy groups. Sister Yasmin Vanya closed our service by thanking God in prayer for so many volunteers uniting to feed the hungry and homeless while building bridges of peace and understanding between our faith communities. Photos courtesy of Ray Hiebert, Olyli Bantuas and Kambiz Naraghi.